At SchoolHouse Connection, one of our guiding principles is that young people are the experts on their experiences, needs, and strengths. We believe we must accept their guidance and follow their lead. We also recognize that students experiencing homelessness often face barriers in accessing higher education. Our Youth Leadership and Scholarship Program is a competitive national scholarship program that provides a minimum of 10 scholarships each year to students experiencing homelessness, to ensure their access to and completion of a post-secondary education program. Through this program, students are provided with a $2,000 scholarship; assistance in navigating barriers such as financial aid; assistance with accessing resources such as mental health and legal advocacy; a strong, stable peer and adult support network; and opportunities to engage in meaningful advocacy. Our overall goal for the Youth Leadership and Scholarship Program is to provide sustained support to see students to and through college and into the workforce. 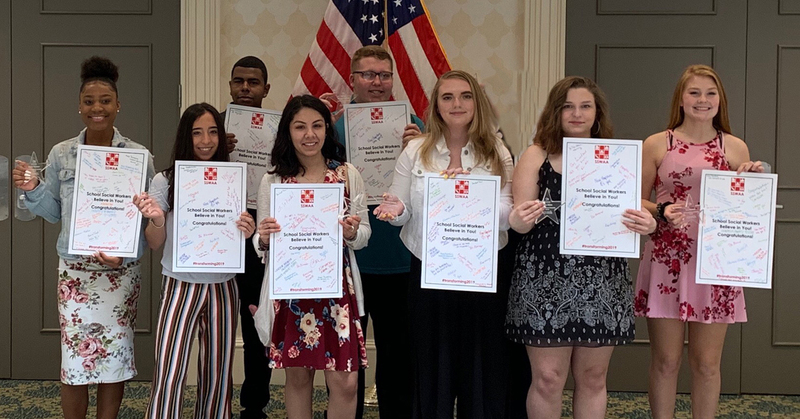 On April 5, we held an awards ceremony for the 2019 class of scholars in Orlando, Florida. Eleven incredible young people from across the country joined SchoolHouse Connection staff, peer leaders, and volunteers for a weekend full of meaningful connection, powerful sharing, and lots of fun. We kicked off the weekend with an awards ceremony during a plenary session at the National School Social Work of America conference. Our peer leaders presented our scholars with their awards and the audience had the opportunity to read powerful quotes written by each scholar. At the conclusion of our awards, our scholars received a well-deserved standing ovation and we headed off to a celebratory luncheon. During the second day of our trip, our scholars presented a concurrent session entitled “Voices” where they shared their experience and wisdom with conference attendees. During this session, our scholars shared valuable ideas and overarching themes, including a request for professionals to be aware of the signs a student may be experiencing homelessness, be willing to ask questions and build relationships with students, and be knowledgeable of key resources that students need. After the Voices presentation and a debrief session, the scholars departed for a fun-filled afternoon at Disney World! At the Magic Kingdom, scholars, peer leaders, and staff rode the rides, ate churros and ice cream, and experienced the magic of Disney. During the closing fireworks show, one of our scholars looked to a Peer Leader and said: “This has been the best trip of my life.” We are incredibly proud of what our 2019 scholars have already accomplished, and we are excited to walk with them, to support them, and to learn from them as they graduate high school and begin college. We are grateful to Walt Disney World Corporate Citizenship and our wide network of generous individuals who donate to our scholarship program. Will you support our scholars?